Can you believe this is the fourth round of The Boys Behind the Blog?! The last three rounds have been a huge success and we have had so much fun getting to know a little more about your husbands/fiances/boyfriends. I know Stephen secretly looks forward to "his" post each month and I hope your men do too! The Boys Behind the Blog is a monthly linkup featuring your husband/fiance/boyfriend/best guy friend/dad/brother/grandpa! 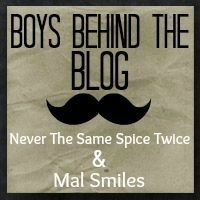 Mallory & I created this link up to brag about our men and get them more involved in our blogs. Here's how it works: we post the questions on the 1st Thursday of the month (today), you ask your man to answer 5 easy questions and then link up with us on the 3rd Thursday of the month. The Boys Behind the Blog #4 Link-Up will go live at 7 am EST on Thursday, September 19, 2013. Have fun asking your guys' these five questions and we can't wait to read their answers on the 19th! looking forward to this. getting the answers from him now. we are making it a getting to know you/see how much you know about me game! Ha!